We are delighted that our BioLock technology – developed in conjunction with sales partners Digitus Biometrics is suitable for those very highly classified and very sensitive applications involving military and governmental data protection. Considered as top end “infallible” systems these installations are similar to existing North American projects with the USA and Canadian authorities. 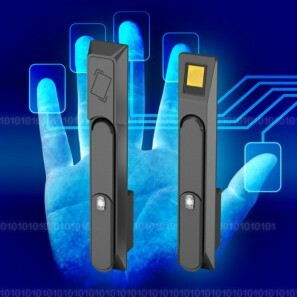 The latest versions of BioLock provide triple authentication with 2 people present, with each person having to fulfill 3 criteria to open the handle – pass code, swipe card and biometric. Providing as they do full fingerprint confirmation that the people are actually there these systems are also suitable for protection of other sensitive large data projects such as airline operation and aircraft production, as well as automotive test and manufacturing, in the protection of data in the daily operation, administration, finance, test and development aspects of these businesses. Please contact us to discuss your high security needs. Share the post "BioLock for Highly Classified and Sensitive Installations"